I try to make the salads we eat at home as diverse as possible. Growing up, my mom made the usual, “Tomato, Cucumber, Red Onion and Lettuce” salad with the most ever famous yet satisfying, lemon and olive oil dressing with salt and pepper. Yup, that was basically the go-to salad for everything. Stepping away from that, I realized that you can put anything in a salad and make it however you want. Therefore, I began to explore the world of salads, yes, the World of Salads. So many different types and so many different kinds of dressings. I thought I was actually cheating on my mom’s salad after I started to make different kinds. Salads with fresh fruit, vegetables, beans, nuts, deli meats, cheese… you name it, I have made it into a salad! 1. 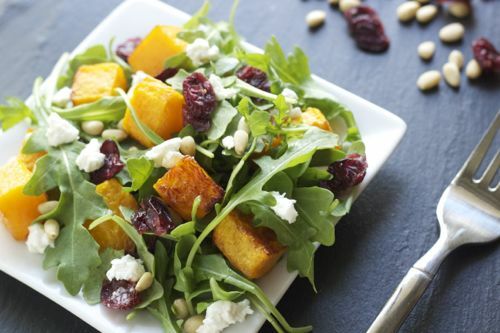 Layer arugula on a flat platter or in a salad bowl, evenly top with some roast butternut squash, pine nuts, parsley, cranberries and crumbled goat cheese. 2. Season with 1 tsp of salt and ½ tsp pepper. *Instead of olive oil and balsamic glaze, you can use a balsamic vinaigrette.